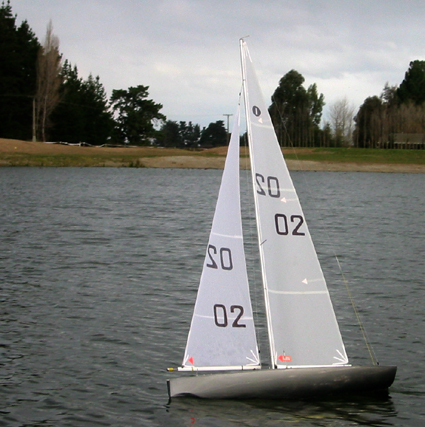 The CMYC supports all classes of model yachts. At the moment the most popular are EC12s and our locally designed "J" class. Recently two of our members sailed their R/C models around Quail Island in Lyttelton Harbour,The boats used were a "Highlander" A Class and a "Star" 10 Rater. Quail Island is a volcanic "plug" in the extinct crater that forms Lyttelton Harbour, it has had various uses over the years - quarantine station, leprosy hospital, base for Scotts polar expedition and farm. The island is now under the control of the NZ Dept of Conservation, is being replanted in it's original vegetation and is a popular picnic spot. 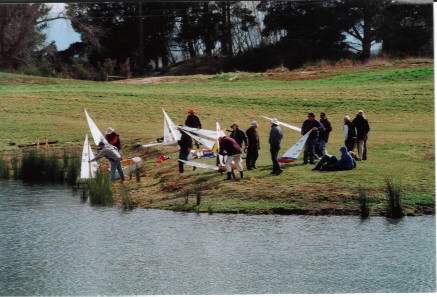 Action at the One Metre Club One Metre Championships. 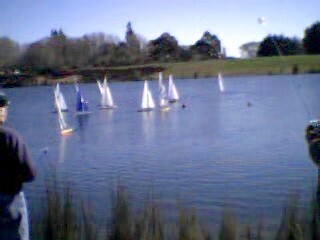 Preparing for another race at the new lake just past Kaiapoi. There were 9 competitors for the event, which was sailed most of the time in a fresh North West breeze.Other times it was almost calm. This is the winner of the One Metre Championships, Incubus, sailed by Keith May. Keith sailed very well and gave nothing else a chance. Full summary of placings on Results page. More pics of Photograph page.